Through the generosity of St. Mary's Church, financial aid is available for those experiencing financial difficulties. To apply for this assistance, please contact Director Reverend Shelley Dungan. GENTLE YOGA (1) Come experience slow-paced, gentle movement blended with meditation and inspired readings. This class will help you release physical tension and mental stress while fostering flexibility and deep relaxation. Most of the time is spent down on the mat using supportive blankets, blocks, bolsters and straps. You will leave feeling centered, calm, peaceful and bathed in Divine Love. 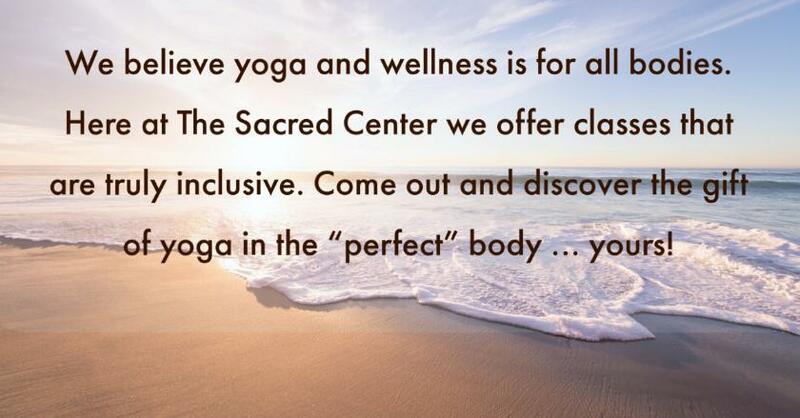 Well suited for those new to yoga, those who are low on energy and those with minor physical limitations. No yoga experience needed. GENTLE YIN YOGA W/ REIKI (1) A beautiful complement to more active yoga and suitable for many levels, Gentle Yin and Reiki is a practice of seated and reclined poses that invite you to be with and observe sensations and responses of body and mind. Release physical, emotional, energetic and spiritual blockages creating a calm, free flow of energy. Find healing, strength and overall well-being. Make this your practice to begin or advance your yoga journey. OPEN YOGA (2) Often called All Levels Yoga - This accessible approach to yoga is both powerful and empowering. You will be provided the opportunity to learn and refine the basics of alignment and form in each pose with clear instruction and individual support so healthy beginners and seasoned yogis alike will feel successful. Many types of poses will be explored and modifications will be offered for students of every experience level. You will leave class relaxed, refreshed, and inspired. CHAIR YOGA (1) This is the perfect class for beginners and those seeking more confidence in their yoga practice. Using a chair enables you to safely learn and explore alignment, balance and movement of the body in various seated and standing yoga poses. These movements, combined with breathing and meditation techniques, help you energize, strengthen and relax both body and mind. Students with physical limitations are encouraged to come! QIGONG (1) Qigong is a mind-body practice that ignites our internal healing capacity. Included are gentle movements, breath practice, self-applied massage and meditation. Can be done standing or seated in a chair. SLOW FLOW (2) In this class students will flow mindfully through a variety of postures designed to build flexibility and internal heat at a slow, steady pace. Class then cools down with Restorative Yoga postures, which settle the body and mind. Ample modifications will be offered to make the class accessible and fun. JOURNEY DANCE (1) A one hour journey of guided movement, intention, community fun and healing. Led by Rev Jennifer Pedrick. All ages welcome and no dance skill is needed. YOGA BALANCE (1) This gentle class is based on structural posture alignment and mobility of spine and joints through yoga poses and breath work. Students will use a chair to varying degrees in order to learn key poses which build strength, balance and flexibility. This class can be a tool to advance into other yoga classes. Students leave centered, energized and better equipped to enjoy everyday activities. YOGA FOR BACK PAIN (1) Has your back pain created a fear to move? Unlock that fear with compassionate observation, breath work, soothing floor work, long stretches and stable poses. Strengthening the core properly and safely is an important component to ease back pain. The pace will be slow with specific directions for alignment and energy, props for all levels included. Learn to move the spine more fluidly, and build your strength with symmetrical balance. Explore these techniques which can easily be practiced at home. My own spine/joint injuries and chronic pain help inform this practice, so I deeply understand. Please check with your current doctor to see if this would be appropriate for your injury or pain. HATHA FLOW (2) This class will get you moving with gentle stretching to wake up the body. Moving into postures with focus on breath and alignment through a gentle flow. You can expect a circuit of the body’s full range of motion with basic standing postures, twists, back bending, forward folding, and hip openers, followed with restorative relaxation. This Ha(Sun) Tha(moon) practice is designed to align and calm your body, mind and spirit. MOM & BABY YOGA - *Mamas must be six weeks post-birth. Find your supportive village of other mamas and new babes in this gentle flow class created to nourish and soothe the post-birth mind and body. A calming time to build a stronger connection with your self and your new little one through deep breathing, yoga poses, and guided meditation. Join our community of understanding and caring mamas to create comeradery and feel more supported in your journey of motherhood. KIDS YOGA - *ages 3-5. A creative time for children and their caregivers to use the imagination through yoga movements, songs, and dance. In these creative and fun ways, the children are beginning to link how their breath feels in the body, helping them to be able to freely express themselves and their emotions with skillful guidance. PRENATAL YOGA - *Open for any woman who has entered her 2nd trimester. A gentle and soothing time to support your self and baby by easing the mind and body throughout your pregnancy. Each class begins with prenatal breath work, allowing the mother to bring awareness to the power of her breath as a direct link to the baby. Prenatal yoga is designed to strengthen the pelvic floor, bring ease to the spine, and create suppleness in the hips; all allowing for a greater sense of well-being and relaxation. PLEASE Speak with your midwife or OB/GYN for clearance to participate. YOGA BUFF (3) Join Shelley for this unique blend of energizing Vinyasa flow with someadded strengthening using assorted light weights. Intended to stretch you out, tone you up and leave you feeling fully embodied. This will be challenging and blissful! For students in good health, with no serious injuries and with some yoga experience.